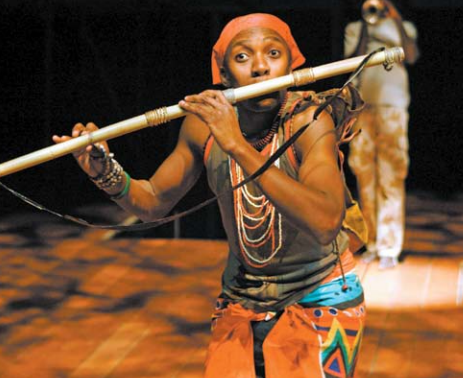 The Magic Flute is a familiar story for Mozart fans but the South African company, who began 12 years ago to create works that would inspire the world to see theatrical performance, have worked long and hard to create a collaborative product. The production is not only enormously successful as a musical phenomena but the story itself invokes numerous cultural references: “Musically we look at this story through a South African perspective because for us the story is about reconciliation, and the process of struggle to achieve a better end.” This is also elaborated upon in the choice of sets and costumes which “While we have taken a certain amount of dramatic license, our costumes are based on traditional South African dress but they also have elements of the Elizabethan courtier.” For South Africans, ritual is central and here the initiation of the journey of boy to man is the central metaphor and accompanied with the specific nuances of the cultural rite of passage. There are also four languages involved including English and Xhosa, one of the official languages of South Africa. While The Magic Flute is an internationally acclaimed production, it is laudable to see that Donford-May prioritises uplifting local culture first and foremost rather than catering to an international palate. “We always build our productions for South Africa and in doing so it’s almost impossible to exoticise our work because we’re making them for a local audience – we believe in what we’re doing and if the world embraces it, that is wonderful, it is our people that we serve first.